For two glorious hours, talented, charismatic performers Al Barclay and Jack Whitam orchestrate proceedings to perfection. Expertly ringing changes of atmosphere and mood, they enact and narrate the tale, which is interspersed with an impressive variety of special effects, superb Poltergeist illusions and frights, songs, parlour games, warm ad-libs, jokes, sprouts and stuffing. Poignant, scary and surprising moments ensure all are rapt, while full-blown laughter rings out loud and long time and time again as Scrooge, as well as all there, are reminded that a true, joyous Christmas spirit stems from the magic of simple pleasures and time shared with others. This evocative, fabulously lit Victorian set is not, though, in a theatre but in a space that was once a shop. Theatre Deli is an arts’ charity that turns disused premises into experimental arts’ venues, a project started in London in 2007 (with venues in Camberwell and Broadgate) and in Sheffield in 2014. 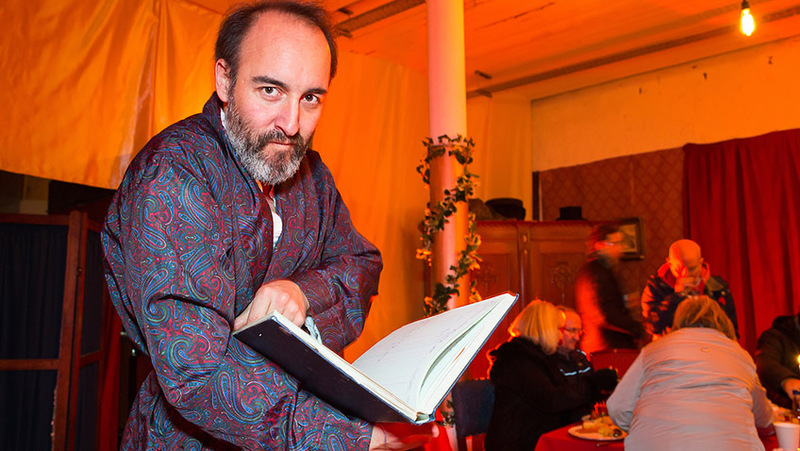 The York-based company The Guild of Misrule team up with Theatre Deli again for this year’s “immersive dining- experience”. Luckily this immersion doesn’t involve being dunked up to the eyeballs in gravy but being plunged into a joyously interactive entertainment that is genuine, laid-back fun and never strained or awkward. The meal, fully integrated into the continuous flow of entertainment, comes courtesy of volunteers at St Mary’s Church, Sheffield, who regularly serve meals made from supermarket surplus to those in need, while York Nurturing Community take charge when the show moves to York Mansion House. 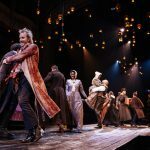 Act I opens with fine impact as Jacob Marley emerges like Frankenstein’s monster in bursts of bright light from a Tardis-like wardrobe. 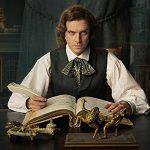 No, this drama is not a traditional, straightforward rendition of the Dicken’s novel, and we, as spectres, replace the traditional ghostly apparitions. But the clock still chimes and tolls, bells ring ominously and major characters are cleverly woven into the piece via enacted scenes, anecdote, innovative torch and shadow portrayals or in eerie reflection in the big mirror over the fireplace. Lines of original text are included and the essence of the book’s message comes over most powerfully. The two fine actors ensure that serious, emotional and unexpected moments take well paced, well judged turns with the humorous and frivolous not only throughout the two acts of the drama, but also, keeping permanently in character, throughout the entire meal. 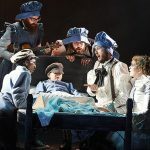 As gravy is passed, crackers pulled, terrible jokes shared parlour games played and songs sung, Scrooge and Marley work the room, interacting with one and all and creating genuinely warm interactions between audience members. 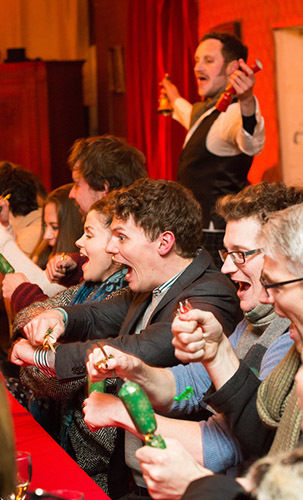 It’s all proof that orchestrated merriment and entertainment really can lead to tremendous fun and genuine joy. It might be ex-miser Scrooge in his white nightshirt who’s seen from the windows at the end of the night, joyfully frolicking and performing handstands in the car park outside, but by then everyone present is in the mood to do the same – and not just those who have stocked up well at the bar. Bravo! 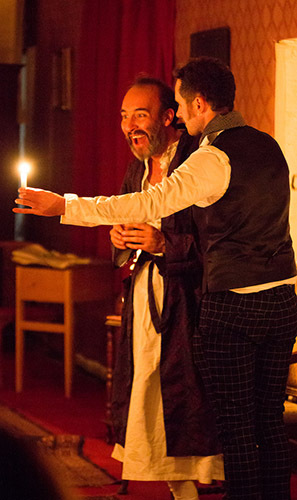 The show is at Theatre Deli, Eyre Street, Sheffield until Dec 16th, then from Dec 18th at York Mansion House.